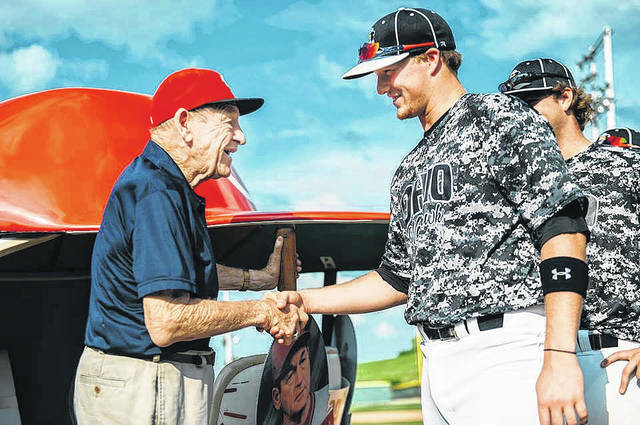 Gene Bennett greets an Ohio Warhawks player during the Gene Bennett Baseball Classic festivities back in 2014. The Gene Bennett Baseball Classic, which has hosted as many as 21 teams across the United States and Canada, was one of the many pleasurable achievements that Bennett helped bring to the Scioto County area. Throughout his storied career in the game of baseball — and, well, the game of life — Gene Bennett meant the world to many individuals. Contrary to what the stats may show, however, it isn’t because Bennett was at least partially responsible for leading the storied Cincinnati Reds’ baseball franchise to three of its five World Series titles in his role as one of the eagle eyes of the scouting department, or because Bennett was one of the first players from the Scioto County area to seriously have a shot at the big leagues. Honestly, it isn’t even because Bennett generously donated to many causes around the area to help shed positive attention to the area. No, Gene Bennett meant the world to many individuals because Bennett was a Grade A person — the kind who shakes your hand firmly, shares his baseball wisdom to you for hours, and does so with a smile, while continuing to think about ways to give back without making himself the center of attention. These kinds of qualities, which are special in any person, are ones that seven-time Major League All-Star and 1971 World Series Champion Al Oliver noticed in spades throughout his lifetime — and are qualities that will be honored during Wednesday evening’s Portsmouth Murals Banquet, which Bennett will be at the center of. The best example of the qualities that made Gene tick, however, came when Oliver wasn’t around. Back in the 1950s — and before they had achieved goals at the highest level in their respective fields — Bennett, along with former Portsmouth High School graduate and Chicago Bears cornerback Curt Gentry, played baseball together on the same team — and, as Oliver puts it — proceeded to tear up the competition with their knowledge of the game and their fire to win. Unfortunately, as has been well-documented during the racially charged era, obtaining positive results on the field was the least of the concerns, especially for Gentry, who, as an African-American, was refused food service during a road trip. When this incident occurred, Bennett, along with his fellow teammates, stood up for Gentry, their fellow teammate and brother in arms — and left with him. And by always being true to himself, Gene became a major success — both personally and professionally. Injuries, which ultimately derailed a promising baseball career on the diamond, didn’t prevent Bennett from putting together a wonderful career as a scout, using his baseball smarts to draft Barry Larkin, Don Gullett, Paul O’Neill, and Chris Sabo among many others — all players who became centerpieces on one, or in Gullett’s case, multiple World Series championship units. Oh, and there’s that kid named Jeter that Bennett also advised the Reds organization to draft — and later became a 14-time All-Star and a five-time World Series Champion across a career that spanned two decades. Even though he ultimately signed with the Pittsburgh Pirates instead of the Reds and went on to create one of the greatest collective outfields in Major League Baseball history, Oliver said that Bennett’s ability to spot talent, and stay on it, was uncanny from the outset. And ultimately, Bennett garnered many accolades with his ability to scout at a high level. Inductions into the Middle Atlantic Major League Baseball Scouts Hall of Fame, along with the inaugural Wheelersburg High School Athletics Hall of Fame Class in 1996 and 2001, respectively, came about due to Gene’s work. Bennett added the Legends of Scouting Award in 2009 as a result of his work in the field from 1958 to 1992 as a scout. Personal accolades, however, were not what mattered to Bennett, as they paled in comparison to what the Wheelersburg native did off of the field. The proceeds from his book, Gene Bennett: My 58 Years with the Cincinnati Reds, ultimately were donated back to the Wheelersburg Little League, which he helped to give legs through other generous measures over the years, and especially its Challenger League umbrella, which was formed in 2006 with a big hand from Bennett. That kindness also transform into the smaller, more unappreciated things, such as paying for a meal. Not surprisingly, Bennett’s ability and personable traits made helping one of the central figures of the Reds’ organization a pleasure that all went to Bennett’s guests. Much of his calm demeanor, however, goes back to Bennett’s confidence and purity within himself. It is believed that much of that came through his faith in God. In turn, that showed toward other individuals. In fact, Oliver believes, wholeheartedly, that Bennett loved his grandsons, Sky and Ty, more than him. As a result, Oliver knew what he had to do when Bennett’s health started to fail. While Gene Bennett isn’t here with us anymore, the impact that he made from July 29, 1928 to August 16, 2017 is one that will stick with Oliver, and many others for a lifetime. Bennett’s book, Gene Bennett: My 58 Years with the Cincinnati Reds, along with one of Oliver’s books, Life is a Hit: Don’t Strike Out, will be on sale at the Portsmouth Murals Banquet, which will commence on Wednesday evening at 6 p.m. Tom Browning, who will be the guest speaker at the banquet, will have his book, Tom Browning’s Tales from the Reds Dugout, available to buy as will. Tickets can be bought at the Portsmouth Area Chamber of Commerce office inside the Scioto County Welcome Center, which is located at 342 Second Street, Portsmouth, Ohio 45662.